Van Hool Party Bus #6098 Newly Converted Call Now For Info. and extended full size bar at separation into suite number 2. Suite #2 features, light grey with carbon fiber white interior, seating on both sides, full size custom bar in rear with ice bin, cup holders, restroom, heavy duty air conditioning all throughout, plenty of under carriage luggage space for long trips, hard bumping surround sound system with amplifier and sub woofers, lasers, color changing star lights and much more!! The 1998 Van Hool Party Bus is available for your special recreational use. 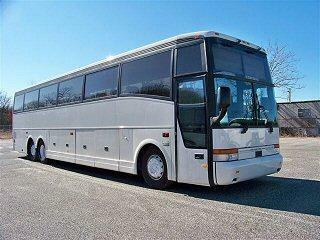 You can use this large bus for all sorts of entertaining purposes. It comes with several great features while offering a beautiful seating space for all your clients or guests. This is a striking vehicle that has 416,000 miles on its engine. It is a rear wheel drive vehicle with an automatic transmission. The vehicle is in perfect working condition all around from the engine up to the many great light and entertainment features that it comes with. It has a white exterior and an interior with a mix of black, gray and tan tones all around. Lighter tones can be found around the front suite area with the second part being darker. This is organized with a two-suite setup. This creates two separate sections for seating and relaxation among everyone who gets on your bus. A small partition can be found in the middle part of the bus to divide the two seating spots from one another. Your guests or clients will be fully entertained by a vast variety of great features inside this 1998 Van Hool Party Bus. This comes with a series of LCD flat screen television sets with a few added media controls. This is mixed with a powerful surround sound system that has its own sub-woofers and amplifier. Amaze everyone on board with a series of stunning displays. The disco floors create some amazing displays all around. Star lights are included with some intense color-changing features. These are scattered around the cabin to create a powerful body. The windows come with a few light pillars as well. These pillars create an added mood all around. This makes for a stunning look that will stand out and give anyone an appealing look that is certainly thrilling and fun. Lasers are also included to create beautiful beams of light all around. These mix in amazingly well with the disco floors. These lasers can also work with a variety of colors to create one of the best looks around. The seating is made with enough room on both sides. The first section of the vehicle comes with a charcoal black and carbon fiber silver inside. The second section is a light grey spot with a white interior and still has plenty of seating on both sides. This offers enough space for all people to enjoy being together on the bus. There are two separate stripper pole sections in the cabin. These are great for hanging around but they are especially fun for some of those more exotic moments that you want to hold on your bus. The bartender station is a full-sized custom setup that has plenty of space for serving drinks. This comes with an ice bin and cup holders. This bar is actually located in a separate suite located on the body of the party bus. The disco ceiling around the vehicle adds a good atmosphere. This comes with a few light effects that aren’t too intense but still manage to create a strong experience. The restroom on this party bus is made with a private design that keeps the user secure. The waste that gets in there will go into a secure compartment separate from everything else on the bus. This will be very easy to clean out in between bus sessions. The powerful air conditioning system works around all parts of the vehicle. This provides more than enough cool air all around. There is also included under carriage luggage space on this vehicle. This space is included to secure the luggage that people have and can especially keep it from shifting while in transit. This makes this bus perfect for when you’re aiming to take this out for hours at a time. The 1998 Van Hool Party Bus is the perfect option for you to find when you’re aiming to get something special that is going to be very entertaining to everyone. This party bus has space for everyone and includes a strong assortment of features that will make this a very entertaining option for anyone to look forward to enjoying. Drive away your Van Hool Party Bus today.